Droichead was very excited about its 2nd outdoor event of this summer last Sunday. ‘Pride and Prejudice’ by Chapterhouse Theatre Company was lined up at the site of Oldbridge House. It turned out to be another exciting, lively family night. ‘Midsummer Night’s Dream’, which was on the 3rd of July, was an overwhelming success with a turnout of no less than 450 people. Despite the torrential rain during the day on Sunday, it stayed dry during the actual event and there was still a turnout of 353 people. Chapterhouse Theatre Company, which produced ‘Midsummer Night’s Dream’ as well as ‘Pride and Prejudice’, is a professional touring theatre company, bringing a wide range of plays to venues all across Great-Britain and Ireland. The company prides itself on fully accessible, traditional, but innovative productions. They have built up quite a name over the past eleven years by mainly specialising in open air productions. Both plays were just amazing and beautiful. The actors were very engaging and came down into the crowd several times. This is a thoroughly hard-working cast. We can now understand why they have such a great reputation. The setting was also quite impressive. Oldbridge House is situated on the famous Battle of the Boyne site, which is not only a major historical reference in Irish history but the site also offers spectacular views on the beautiful Louth/ Meath countryside. Imagine plenty of people picnicking in the grass on comfy blankets while watching a marvellous play. Turns out, this is a successful formula and a great way to spend a lovely summer night. 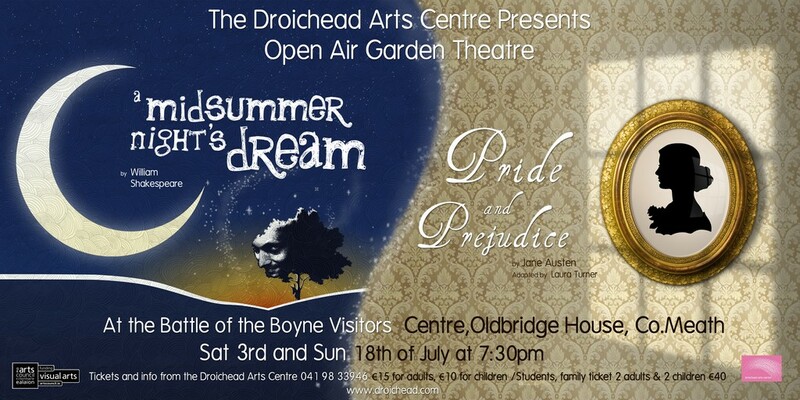 Droichead is over the moon with the success of these events and is hoping to organise more open air theatre next summer. Keep an eye out on our blog for pictures from both events. This entry was posted on July 21, 2010 at 9:24 am and is filed under Events/ Festivals. You can follow any responses to this entry through the RSS 2.0 feed. You can leave a response, or trackback from your own site.